My Boys are now the willing eaters of chickpeas, every day - on toast, on digestive biscuits, as a dip for fruit - honestly! Chocolate hummus is a great alternative to chocolate spread as it is packed full of is packed with Vitamins C and B6; protein, carbs, iron, zinc and manganese. Hummus - a chickpea spread originated in the Middle East. Although the exact origin country is unknown. Hummus is Arabic for chickpea and is an integral part of the cuisine of many countries including Jordan, Syria, Egypt, Palestine, Turkey, Israel and Lebanon. Loved throughout the world, it also has its own international day. International Hummus Day is celebrated on May 13th. There are many different varieties but most are usually savoury - red pepper, aubergine, beetroot and courgette, however, this recipe creates a sweet hummus. Chocolate hummus. WARNING: I really do have to warn you that if you continue reading, your life will be changed - for the better I may add. 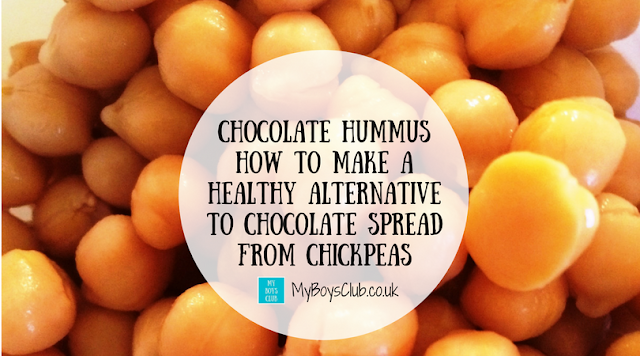 It was during #NationalChocolateWeek earlier this month that I saw a few posts about chocolate hummus. Reading them, it all seemed so easy too. Simply add cocoa powder (and a few other ingredients) to chickpeas in the same way that you would, to make your usual hummus. Well, that sounded easy enough, but would it really taste any good? The recipes I had found online, used a variety of different ingredients as a sweetener including maple syrup, honey as well as an addition of vanilla essence. Being out of maple syrup and honey I adapted the recipe for what I had in the store cupboard. 1. So I opened a 400g tin of chickpeas, drained and rinsed and then put them in the blender. 2. I then added to this all of the other ingredients (except milk) and whizzed it up. 3. Once it was smooth I then added the milk to thin it out. Serves: We used it constantly for four days. But as it was healthier we used it far more frequently than if it were chocolate spread. Boys Club Rating: As much as I love savoury hummus I think I'm going to be adding cocoa powder to my chickpeas for a long time to come. Chickpeas, also called garbanzo beans, belong to the legume family, which includes a variety of beans, peanuts, soybeans and lentils. They are a vegetarian-friendly source of protein, are a rich source of fibre and also contain vitamins and minerals and significantly boost your intake of manganese and folate. What food have you made from a surprising ingredient?